Baltimore is at the epicenter of the national debate over police violence, particularly after last week’s release of a Justice Department report documenting deep racial disparities in policing in the city. That makes it particularly surprising, if not bizarre, to find a well-known neo-Nazi lawyer serving in the city’s Law Department and defending the Baltimore Police Department. Editors note: The Office of the Mayor, Stephanie Rawlings-Blake, released a statement that the City has terminated the contract of Glen Keith Allen. The termination is the result of an internal investigation, prompted by the Southern Poverty Law Center’s report that exposed Allen as longtime member of the neo-Nazi organization, the National Alliance. Attorney Glen Keith Allen, 65, however, has a long history of supporting one of the most notorious hate groups in America, the neo-Nazi National Alliance (NA). The NA was founded by William Pierce, who wrote the novel that served as the blueprint for the 1995 Oklahoma City bombing. Allen is a longtime donor and member of the NA, and public documents identify him as such. Even so, he was recently hired as an employee by the Baltimore City Law Department and is now defending the city in a lawsuit alleging that police officers withheld and fabricated evidence to wrongfully arrest and convict an African-American man for a murder it appears he did not commit. The man, Sabein Burgess, spent 19 years in prison before being freed in 2014. Allen’s history with organized racism and anti-Semitism is deep. Records obtained by the Southern Poverty Law Center (SPLC) show he was a dues-paying member of the National Alliance for years. 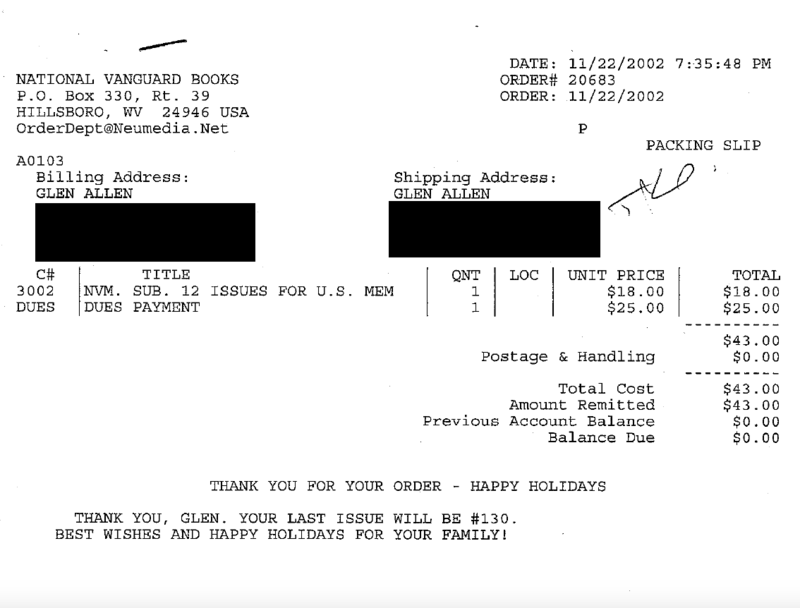 Allen was also a subscriber to the NA’s racist publications, purchased entrance to a Holocaust denial conference the group held and bought a Holocaust denial DVD the group sold. 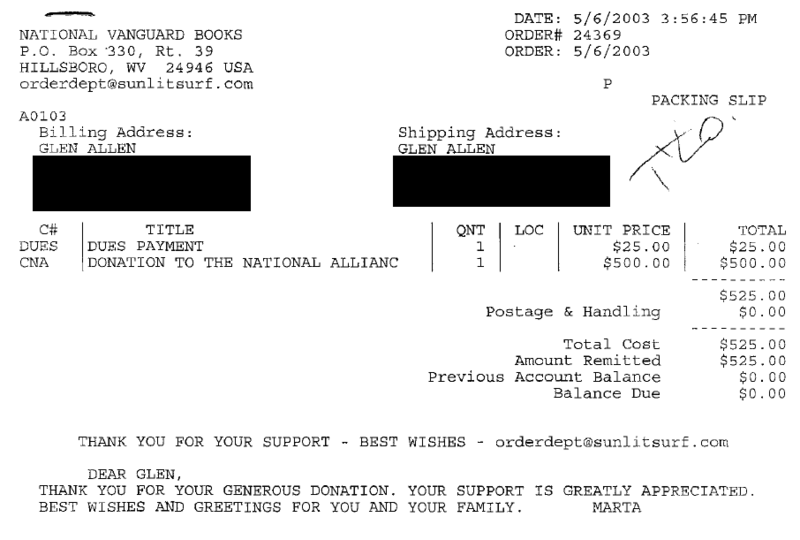 Receipt for National Alliance dues payment and $500 donation made by Glen Allen. 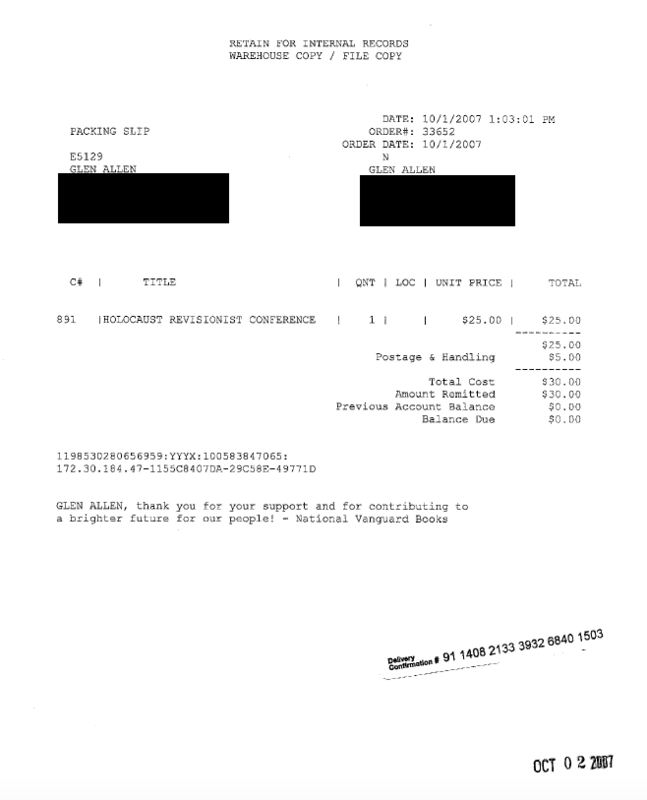 Receipt for Holocaust revisionist conference admission. The bottom of the receipt reads: "GLEN ALLEN, thank you for your support and for contributing to a brighter future for our people!" 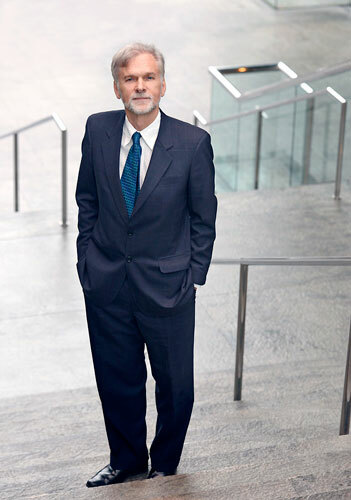 Allen is employed by Baltimore’s Litigation and Claims Practice Group. No one in that office or the mayor’s office would comment on the record about the hiring of Allen. It would not have taken much effort for the city to find about Allen’s background. A simple search would have revealed that he has made political contributions to a racist political party, the American Eagle Party (AEP) National Committee, according to FEC records. An offshoot of the racist American Freedom Party, the American Eagle Party is run by perennial fringe presidential candidate Merlin Miller. Miller traveled to Iran in 2012 to promote a film project. In an interview with Iran’s Press TV, Miller claimed the Israeli intelligence service, Mossad, was responsible for the 9/11 attacks. Allen also appears to be an officer in the AEP. A post on the neo-Nazi web forum Stormfront identifies him as the group’s national secretary, though he is identified in an AEP newsletter as the group’s “Vice Chairman/Parliamentarian.” The party was promoted heavily on Stormfront last year. FEC records show Allen is the AEP’s largest contributor. In a brief, and somewhat odd YouTube video posted last October, Allen introduced the AEP’s debate on the dangers of vaccinations, stating it was “dedicated to truth.” Allen’s video was promoted on Stormfront the day it was released. There is more publicly available information on Allen’s association with extremists. Allen was publicly identified as the attorney for the National Alliance on the neo-Nazi Vanguard News Network (VNN) forum almost a decade ago, in a post by current NA Chairman Will Williams. The SPLC also reported Allen as the NA’s attorney in an article last year. Baltimore’s Litigation and Claims Practice Group is arguably one of the most aggressive and successful defenders of police misconduct in the country. The Burgess case is one of three cases against Baltimore currently before the courts that allege wrongful incarceration. In those 109 cases, only two officers were charged, and one was acquitted by a jury. Even when Baltimore police are found to have wrongfully murdered an unarmed African American, the cost is low. A 2014 study by the Baltimore Sun showed the city spent more on legal fees for outside counsel than it paid in judgments and settlements in more than 100 civil cases alleging police misconduct. Because of the state caps on civil damages in police abuse cases, more than 100 cases cost the city $5.7 million dollars in damages, while the legal fees spent on outside lawyers exceeded $5.8 million dollars. Allen may well be a skillful attorney. But at a time when Baltimore and its police department are facing devastating criticism over their policing practices, and a crisis over their treatment of minority residents, the hiring of a known neo-Nazi to litigate for them surely raises questions. 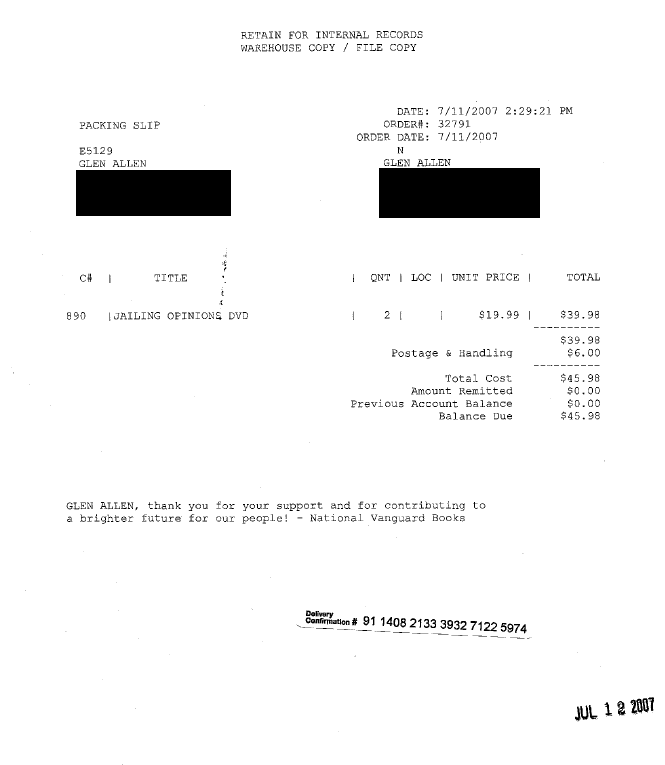 National Alliance dues payment made by Glen Allen.